DANDENOND VIC 3175. JUST SOUTH OF POUND ROAD. AS OF THE 21-FEBRUARY 2012. They will be trading at a new larger showroom. 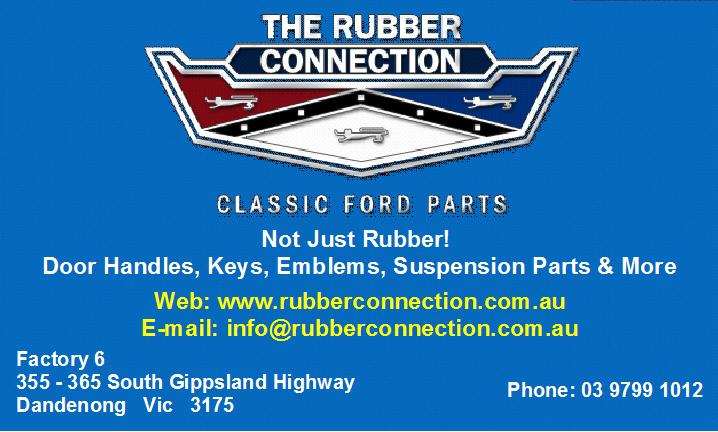 their large inventory of quality Classic Ford Parts. They can help with Parts, for Repairs and Restoration. Genuine FoMoCo and quality reproduction parts. COD and credit card facilities available. Door Handles, Keys, Emblems, Suspension Parts & More. then just click on the link below. REMEMBER TO SUPPORT THIS BUSINESS IN YOUR REPAIRS, RESTORATIONS AND MAINTENANCE AS THEY SUPPORT OUR CLUB.